TripAdvisor announced the results of its Cities Survey, a look into how travelers and locals view 40 key tourist cities around the world. The results were compiled based on more than 75,000 responses to a survey sent to those who have recently written TripAdvisor reviews on the featured cities. 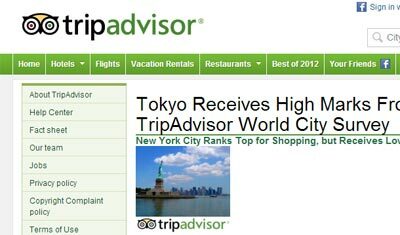 Tokyo was the most highly decorated world city ranked number one for best taxi services, friendliest taxi drivers, best public transportation, cleanest streets, and safety. While New York City was ranked top for shopping, travelers felt the city streets could use a sweep as the city ranked 28 out of 40 for cleanliness. Global respondents also believed visiting the Big Apple may break the bank as it is ranked 32 out of 40 for value.